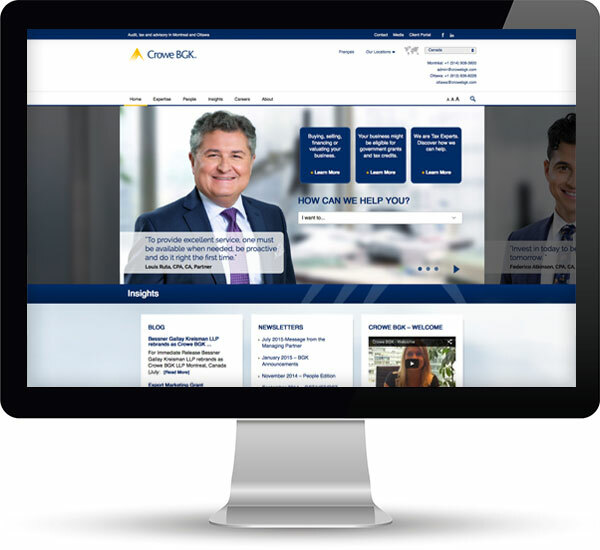 Crowe Horwath in Canada is one of the ten largest accounting networks in the country, and is represented by the three firms of Crowe BGK, Crowe Soberman, and Crowe Mackay: 11 offices altogether. In the increasingly competitive world of accounting, tax, and advisory services, the firms recognized that their go-to-market messaging had to be more coordinated. In fact, one of the key benefits of being part of the same network was the opportunity to share marketing resources, content, website strategy, technology and design. Each firm’s existing site was either designed more to hew to staid international brand guidelines, or which had no connection to these standards altogether. None of the sites were built on a social platform, and none of the sites were “responsive”: they were not truly usable on a mobile or tablet. Most importantly, there was a fundamental disconnect with the firms’ marketing and business development processes. None of the existing sites were optimized to either collect leads – or demonstrate subject matter expertise. We led the web project, from focus groups, to information architecture, to content, to design, to development, to testing, to launch, for three sites, all delivered within four months, and all delivered on time, and on budget. The project involved significant interaction and knowledge transfer with the three firms, as this was the first coordinated national trio of websites that the group had worked on. All three sites are responsive (accessible on tablets and smartphones), AODA compliant, SEO-optimized, and for one of the sites, completely bilingual. In addition to the main firm sites, we also developed several microsites, including a “Canada” hub site, and an insolvency microsite. For the first time, Crowe Horwath in Canada has a coordinated national digital presence. More importantly, given the significant knowledge transfer and strategy work that was part of the project, the marketing leadership of each firm have a better working knowledge of what is possible with the platform. As the sites are built on a social platform, all posted content is syndicated throughout Social Media as well.